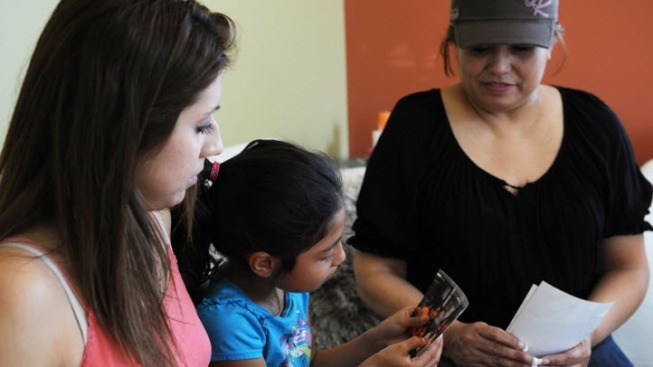 Michael Garcia's daughter, Michelle (center), looks at childhood photos of her father with her mother, Candy Vaquerano (left), and grandmother, Yamileth Fuentes (right). Michael Garcia has spent nearly five years in legal battles to determine who is responsible for providing special education to inmates in California's county jails. TEHACHAPI, Calif. –School ended for Michael Garcia with a routine transfer from juvenile hall to adult county jail. There was no fanfare, diploma or cap and gown. He hadn’t graduated or dropped out. For the next 19 months, he was in limbo, unable to receive the high school diploma that he’ll need for most jobs and to attend college. Despite being eligible for special education under state and federal laws – Garcia has a learning disability, an auditory processing disorder and a speech and language impairment – in the Los Angeles County Men’s Central Jail, he was a student that no one wanted to teach. California and federal laws allow students with disabilities to receive special education services until age 22. But the laws are vague enough that deciding who should provide that education is unclear. Garcia has spent nearly five years in legal battles trying to hold someone accountable. This year, the California Supreme Court is expected to hear Garcia’s case to determine whether an incarcerated student’s local school district – the one in which his or her parents reside – is responsible for his or her special education. The case has implications for county inmates with disabilities and school districts across the state that could be required to send teachers into jails to instruct special education students. In L.A. County jails alone, attorneys for Garcia estimate, between 400 and 700 young adults are eligible for special education on any given day. During a recent interview in prison, Garcia recited the Lord’s Prayer quickly, unblinking, through the thick glass of a visiting booth. The words weren’t always this easy for him to recall. Garcia grew up with his mother, Yamileth Fuentes, and four siblings in Bell, a small city in an industrial corridor southeast of downtown Los Angeles. After long hours of driving a county Metro bus, Fuentes would return home and teach Garcia angel prayers, first in Spanish and then in English, by having him repeat after her, line by line. Even after a month of saying the same prayers every night, Garcia would struggle to recite them on his own, Fuentes said. And because Garcia glossed over R’s and L’s, his words were garbled and difficult to understand. In second grade, Garcia was found to have a learning disability caused by an auditory processing disorder and a speech and language impairment. He was assigned weekly speech therapy and placed in a special education class. Garcia said he hated the class for separating him from his peers and because it made him feel stupid. So in sixth grade, when he realized he had been mistakenly placed in a general education course, Garcia said nothing. He relished the chance to prove he was smart, that he did not need special education after all. “It was a conflict I had with myself because I knew I was smart enough,” he said. He failed the class. With an F on his report card, Garcia was dropped from the Bell Police Department’s junior explorer program, in which he had been a proud junior cadet who hoped to someday be a police officer. Garcia said he got involved with the wrong crowd shortly after. By the time he finished middle school, he was a member of the Barrio Mojados gang. One evening in January 2006, Garcia was acting as a lookout as his friends tagged a corner store wall in South Los Angeles when two men from a rival gang came up to them and started shooting. Garcia said he ran toward them, shooting back. He then took cover behind a car in the driveway of a nearby house. The man and woman who lived there told Garcia to get out and tried to push him off their property. As the couple tussled with Garcia near the front yard, another teenage boy approached, pulling a gun from his waistband. The couple testified that Garcia told the other boy, a fellow gang member, to shoot the man – a claim Garcia denies. Still, the other boy fired, striking the man’s pants. Garcia was sentenced to 12 years in state prison for one count of attempted murder and two counts of vandalism. With time served, he’ll be released in 2016, when he’s 26 years old. Garcia was a high school freshman when he was sent to Barry J. Nidorf Juvenile Hall in Sylmar to await trial. The Los Angeles County Office of Education ran the special day class he attended and provided him each week with 45 minutes of speech therapy and 30 minutes of counseling, to help him manage frustrations he felt because of his learning disability. A few weeks after he turned 18, he was transferred to an L.A. County jail, and his special education services vanished. Under California law, county offices of education serve students in juvenile halls. For all other students, state law generally holds the school district where a parent resides responsible for special education. The district remains responsible for the student, who may receive special education services until age 22, as long as his or her parent lives within district boundaries. An administrative law judge in 2009 found that the law extends to students incarcerated in county jails and ordered the Los AngelesUnified School Districtto provide special education services to Garcia, which the district did while also appealing the decision. A district court judge affirmed the decision, and L.A. Unified’s second appeal is now awaiting a hearing before the California Supreme Court. While the case is pending, a related class-action lawsuit – filed by Garcia and 10 other inmates against the district, state, county office of education and Los Angeles County Sheriff’s Department, among others – is on hold. L.A. Unified is “meeting legal requirements” to provide special education to inmates whose parents resided in district boundaries when the inmate turned 18, a district spokeswoman said in an email. The district currently provides special education services to one of L.A. County’s 18,520 inmates, said Sheriff’s Department spokesman Steve Whitmore. At most, he said, the county has had no more than five inmates receiving special education, all from L.A. Unified, at the same time. In court documents, L.A. Unified said that because there’s no law specifically assigning school districts to provide special education to inmates, the state Department of Education is responsible. The state, on the other hand, said it provides special education services only if it finds local agencies are “unwilling or unable to do so” – a circumstance that it said was not the case for students in Los Angeles County jails. The state is “shirking their responsibility,” said Paula Pearlman, executive director of the Disability Rights Legal Center and an attorney for Garcia. When the local district and county education offices fail, the state is the “district of last resort,” she said. Since Garcia’s transfer from county jail to state prison in September 2010, the special education services he received under court order from L.A. Unified have stopped. He’s currently housed in the California Correctional Institution in Tehachapi. Every Tuesday, Garcia attends a three-hour class in the prison to help him pass the General Educational Development test, which inmates can take once a month. Practice exams have been challenging, he said, because he needs more time to comprehend each question than the test allows. The algebra in the test is difficult, too, especially because he can’t study with a calculator in his cell. He plans to take the test as soon as he can receive additional time – an accommodation called for in his individualized education program, a legal document that outlines a special education student’s goals and services. While Garcia’s case before the California Supreme Court is limited to L.A. Unified, Pearlman ultimately wants the state to provide oversight. The independent, nonprofit Center for Investigative Reporting is the country’s largest investigative reporting team. For more, visit www.cironline.org. The reporter can be reached at jlin@cironline.org.